Have you ever heard of jumping on the trampoline? It must be sure. Trampoline is one of the most popular apparatuses creating a good background for your families both indoor and outdoor. Also, jumping on trampolines brings us a lot of benefits including health, skill and education. Among them, jumpers stress the most useful function of this type is Balance. Besides, it is necessary that keeping your body in balance is also the most importance in order to successfully jump or bound on the surface of trampolines. In general, all of us, including normal as well as professional athletes understand that great balance is the key of any physical activity, especially on hard surface as same as trampoline. Keeping balance is very critical for our own life because it can makes your daily activities easier, helping you avoid injures related to falls or bad physical alignment, unwanted accidents when you are on workout routine. Jumping on trampoline is sometimes seen as riding a motor. Improving this skill means that you are enhancing your balanced ability. Balance helps you control of movements during stationary and moving tasks from running, standing, jumping up and down… without throwing away from the trampoline’s mat. How Balance when you Jumping on Trampolines? When it comes to balance, you need to know how balance in your body. It is because the regulation of its activity will be helpful for yourself to utilize this skill on bounding on the trampoline. Ears are proven very important in balance by scientists through a lot of research and studies. It has a large role for the vestibular system arising in the inner ear and at the same time, being responsible for any changes, movement in positions of your head as well as direction and speed of every movement. In fact, when your body in movements, balance can be learned and improved more quickly. For example, right from kids learn how to stand on their feet, it means that they need to know balance skill. The first lesson of the very young age requires us to keep body in balance. It is not so complicated with the smooth surface but on the trampoline, you are asked to more skilled lessons. Therefore, one of beneficial things from playing on trampoline must be balance and motor skill. It is considerable that the jumping mat of your trampoline flexes in various directions, even all of ones. This causes a challenging stimulation for your sensory systems, including your brain. 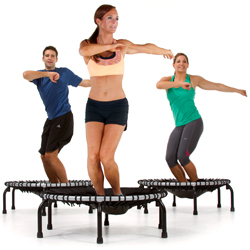 Standing, jumping on the rebounding mat asks you to force your body in a condition of constantly different gravitational changes through cycle of it. The balance is necessary for you to keep motion of bouncing up and down, at the same time against the gravity and keep you standing or jumping without spilling out from the surface. This is exactly your movement of normal rhythm. Moreover, it is because the surface flexes in all direction, it adds to more range of motion, making your exercises more effective and helpful for your balance system in turn. Thanks for that, your own body will be ensured to stay strong and healthy as well. Everybody highly claims the outstanding function of trampoline must be healthier body, as the result. It could be concluded that balance training is an indispensable skill to play trampoline and it will be improved through jumping on it for the better motor skill in the future. You can be explained more clearly that the trampoline is basically a type of hard surface. When you start rebounding on the trampoline, a pliable surface your body automatically works such as to keep it aligned and upright. Once you do a bounce, your inner ear as well as cerebellum will jump into the activity, maintaining muscles to stabilize your body. That is the way your muscle responds to the balance requirements on a hard surface. How to improve your balance skill when jumping on trampolines? How to successfully jump on the trampolines is very difficult but how to keep you body in balance before making great bounces or after them is not less complicated. Thus, before you playing the trampoline, you could see some useful conference to know how to improve this necessary skill. You could start by standing on with a foot in front of the rest. At the same time, keep toes of the left foot touching heel of the right one. This position should be held for about 30 seconds; certainly if possible you could hold for a longer time. But, remember to let your eyes be closed. All elements including stability, equilibrium or steadiness are the main factors to improve your balance ability. As the mention above, balance appears when your body in the condition of gravity center over your base of support. Usually, the balance needs some certain sectors vision, the vestibular and proprioception system of each body. In order to improve the balance skill, you could flexibly combine parts of sensory system like coordinates sensation of touch, pressure and vibration. Through these sensory tools, your body and brain signals and feedback talk about your body’s positions. Also, when you have good improvement balance still, your body can avoid fall-related injuries at first. It will protect you and give you a full chance to enjoy rebounding on the trampoline. And for the next time, you even move and slip on ice surfaces or so on. Balance is a skill playing crucial role for everyone when they play on the trampoline. Jumping on this type of apparatuses requires balance skill and in turn, the most effective way for you to improve it. Enjoy your rebounding with trampoline from now.